The Hyperbaric Institute of Nevada (HIN) is an IBUM Certified and ANDI Member HBO Center located in Henderson, Nevada, in the southeastern area of the Las Vegas Valley. We have created a unique and private outpatient hyperbaric therapy experience. We have done this by providing modern and upscale facilities, comfort and cleanliness, and an expert hyperbaric team that provides private one-one-care. The Hyperbaric Institute of Nevada is located next to the luxurious community of MacDonald Highlands at the foot of the McCullough Mountains in Highland Plaza, a master-planned medical and professional business plaza. If you are seeking the ultimate in comfort and privacy along with safety and expert hyperbaric treatment in Las Vegas, then our hyperbaric oxygen treatment experience is the preferred choice. We are about a 15 minute drive from the Henderson Executive Airport and about 20 minutes from McCarran International Airport in Las Vegas. 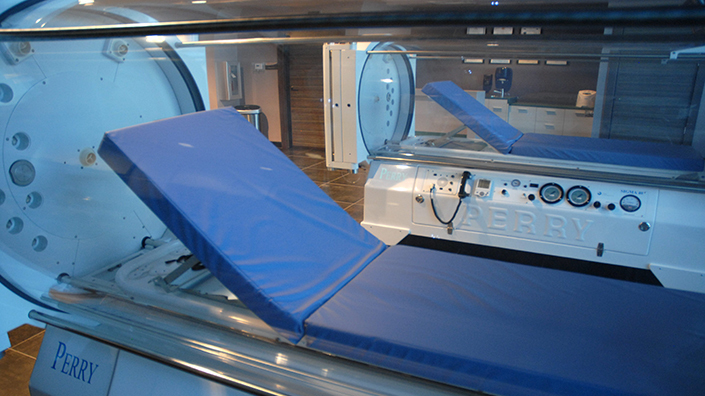 The Hyperbaric Institute of Nevada utilizes state-of-the-art Perry Hyperbaric 40.5 inch Monoplace Chambers and provides hyperbaric treatment for a variety of conditions. These large chambers are the ultimate in comfort and safety and along with our unmatched professional chic atmosphere, we provide you with an effective and safe HBOT experience. The hyperbaric team consists of a uniquely hyperbaric-trained and experienced medical director, supervising physicians and certified hyperbaric technologists with a support team for general operations. The expert team can also be found volunteering their time in the community and attending educational opportunities and conferences nationwide. Some examples include attendance at the 2018 12th International Symposium for Hyperbaric Medicine (HBOT2018) in Aurora-Denver, 2017 12th World Congress on Brain Injury in New Orleans and invited guest lecturer at the 10th & 8th International Hyperbaric Symposium for Hyperbaric Medicine (HBOT 2016 & HBOT 2014).